The infrared, optical precipitation sensor detects the onset of precipitation and uncovers the sample container within five (5) drops. Within two minutes, after precipitation stops, cover returns to sample container to minimize exposure to dry deposition. Sensor also detects drizzle, heavy fog or light snow, which may carry significant amounts of deposition. Collection of uncontaminated wet deposition samples is essential to precipitation chemistry validity. Compact design minimizes splash from exterior surfaces. 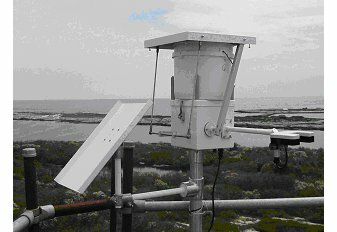 In areas with high wind, the sampler may be fitted with an optional Alter Screen. The compression seal on the underside of the cover prevents leakage of dry deposition in to the container and retards sample evaporation. When the cover System is opened the underside is protected from ground splash by a shield that covers, but does not contact the seal. Reliability is essential to the collection of valid samples. The ADS/NTN runs interchangeably on either line power (110VAC or 220VAC) or (12VDC) with an optional external power converter. Cover drive is rated for 20 years of typical service. All parts are easy to replace without special tools. The ADS/NTN is mounted on a 2” NPS pipe by a socket secured with 2 set screws, so that it may be easily rotated. 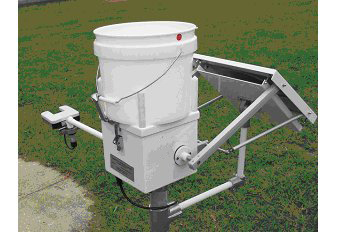 The sampler also provides a 4 conductor cable to connect to an unpowered auxiliary contact that closes during precipitation events. This contact can operate a user furnished data logger and/or event recorder pen in a Belfort Universal Raingage. 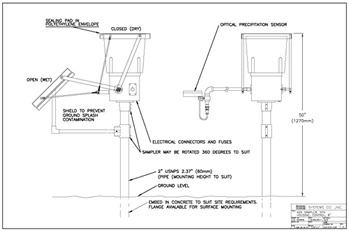 System will also interface with a variety of electronic, weighing rain gages. A normally open contact is also provided for monitoring power continuity.